Another excuse for cake came up last week. And since it was my choice (yes, it was my birthday!) I decided to make a cake with a real treat on top (and inside too). It’s a favourite of mine without any decoration, but the frosting makes it special. I added some pretty crystalised sugar too. 😉 Here’s a closer look! Cream together the sugar and butter until smooth. Beat in eggs, one at a time, and then orange and lemon juice and zest. Fold in sifted flour and salt very gently. Fold in grated carrots. Add extra milk if batter is thick – it should drop off the spoon. Divide between two sandwich tins and bake for at least 40 minutes, or until golden and firm in the middle. Here’s a slice just for you! What’s your favourite cake? And do you like frosting? This entry was posted in Food, Recipes and tagged Food, Recipes, Vegetarian. Bookmark the permalink. Happy Birthday Cathy! Your special cake makes my mouth water. Carrot cake and I go way back (yum!) and not everybody understands that cream cheese icing makes it supremely tasty. I understand completely… then we are partners in crime! 😉 Thanks Susie! Happy Birthday Cathy! Your cake looks awesome. Happy Birthday!!! Cake looks delicious! Thank you Angie – it was very tasty! Happy Birthday Cathy!!! 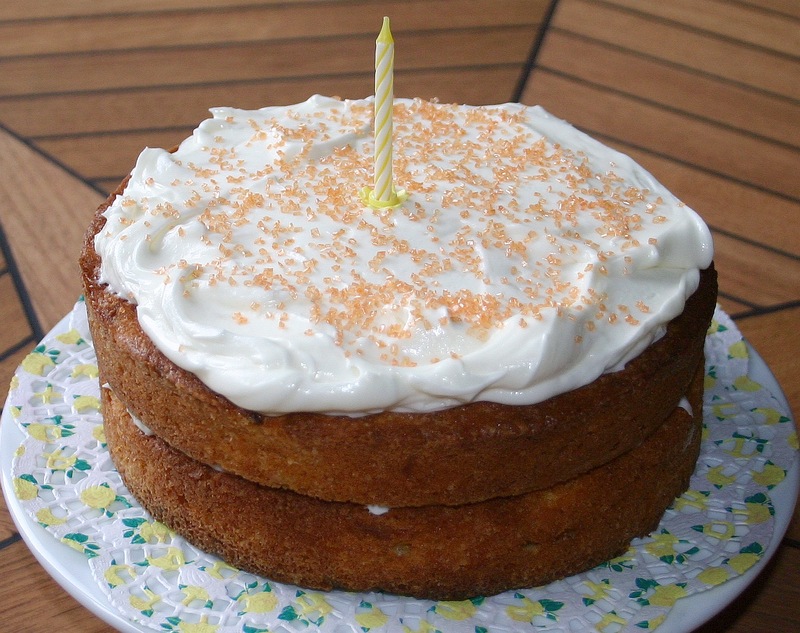 Your cake looks wonderful… I love carrot cake and make it all the time. My recipe is different than yours, I might have to give your recipe a try. I hope you had a special day! Happy Birthday! And cream cheese frosting is required! On one’s birthday a scrumptious cake is a must. I am so glad you made a favorite recipe! Half the reason I grow carrots is to make a carrot cake very fall. It’s one of my favorite cakes, Yours looks delish! Happy birthday! Thank you! I have usually made this cake as an Easter treat, but I tried a new recipe last Easter that I didn’t really like…. So I was craving this cake – you can’t beat old favourites! My favorite cake is Black Forest, although as you know i’m partial to pie. I wouldn’t throw rocks at carrot cake, though. Black Forest is really special too, and very elaborate – but I’d only choose that if someone else is doing the baking! Happy Birthday, Cathy, and a wonderful year ahaed! It take a slice of your cake. Is this cake frosted after finishing? Yes Carrot cake is my favourite too, will certainly try your recipe. Hope you had a lovely day for your Birthday, belated greetings! Ooh, haven’t had a coffee and walnut cake for ages! Boozy fruit cake sounds nice too, but without the marzipan/icing for me. That’s got me thinking about Christmas now! Thanks for your good wishes Janet. Happy birthday Cathy! 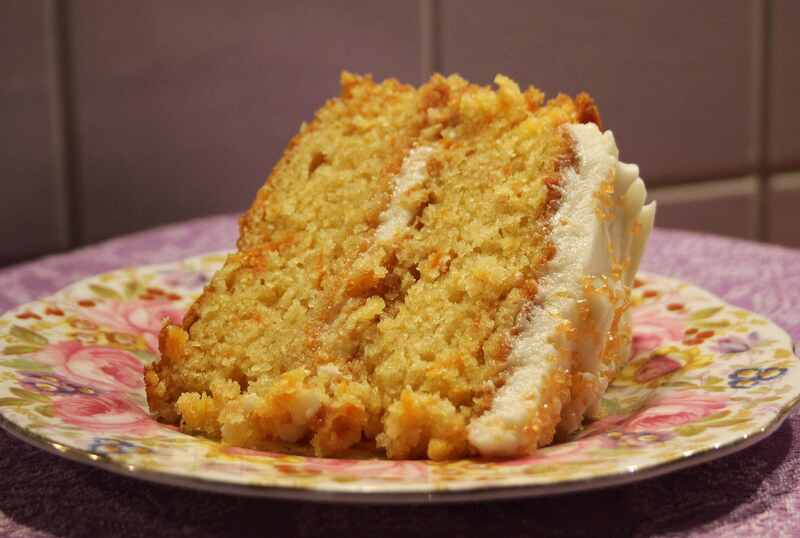 Carrot cake is my absolute favourite – the recipe I usually use has spices in it, but I like the idea of orange with the carrots in yours… need to try that sometime soon! Happy Birthday! I love carrot cake too, although tempted to try a pumpkin version due to my monster Mother Hubbard squash harvest. The frosting looks amazing. Happy Birthday, Cathy! What a delightful (and delicious) way to celebrate! My aunt makes a carrot cake that I really love (she keeps the recipe a secret but she insists that the key is “extra carrots”) and I make a lemon cake similar to one you posted I believe last year that I’m very partial to. But my rhubarb upside down cake is my absolute favourite. (The recipe is here, although unfortunately I didn’t post any photos: http://www.grit.com/food/rhubarb-cake.aspx#axzz2i53mRjB4). Sorry I’m late with my birthday greetings to you, I hope you had a lovely day. Happy Birthday. Glad to have met you too Annette! Yes, It would be lovely to sit and chat about plants and stuff over a cuppa. 😀 Have a lovely weekend Annette! Happy Belated Cathy! A wonderful choice…. I love carrot cake and frosting! Hope it tasted as wonderful as it looks…Divine! Thank you! It was deelish! Thank you! It’s a nice time of year to celebrate! I’ve always picked carrot for my birthday…UNTIL NOW…after being inspired by Jason’s recent post. Dutch apple pie will be the choice next summer. Lovely blog, you have here birthday girl. Well, Jason’s post also got me thinking – it doesn’t have to be a birthday “cake”! I did enjoy this one though! 😉 Thanks for stopping by Patrick! Carrot cake is a great favorite of mine, too. And i can justify the calories by reminding myself how healthy carrots are! I like the logic! 😉 Thanks for stopping by! I love cream cheese frosting. I don’t have to have a cake with it 😉 but your carrot cake looks delicious.